After initially listening to the first couple seconds of IMMORTAL‘s comeback album, Northern Chaos Gods, you realize that you owe the band a huge apology for doubting them. A raging storm of ice and snow blast forth in a way that only Bergen, Norway’s finest can produce. Despite the departure of original vocalist and bassist/guitarist, Abbath, and him allegedly taking most of what was supposed to be the band’s next studio album for his solo album, IMMORTAL is intact and true to their legacy. Demonaz takes on vocal duties in masterful fashion and, most importantly, returns to his rightful place recording guitars for the band. Peter Tägtgren (HYPOCRISY, PAIN) pulls double duty as producer and session bassist. While it is accurate to say that IMMORTAL finds much inspiration in their colder, faster sound from around the mid-90’s, Northern Chaos Gods is not a total throwback or a regression. The mastery and epic sound that the band honed so well in the 2000’s is still intact as evidenced by songs like “Gates to Blashyrkh” and “Mighty Ravendark.” The one characteristic that is not as strong as the hooks that were ever so present in their last couple of albums. However, Northern Chaos Gods is still a satisfying and enjoyable album. Without a doubt Swedish death metal legends HYPOCRISY have written many excellent songs through out their career. However, one song stands alone as their absolute best. No, it’s not something from early days with Masse Broberg or the doomy period but from their more melodic era. On their self-titled sixth album, released in 1999, HYPOCRISY dig from within with “Elastic Inverted Visions.” The song is simply epic in its feel and mainman Peter Tatgren puts out a great vocal performance. The melodic guitars and the balls out guitar solo in the middle are so damn good. Check out the song and let us know if you agree. 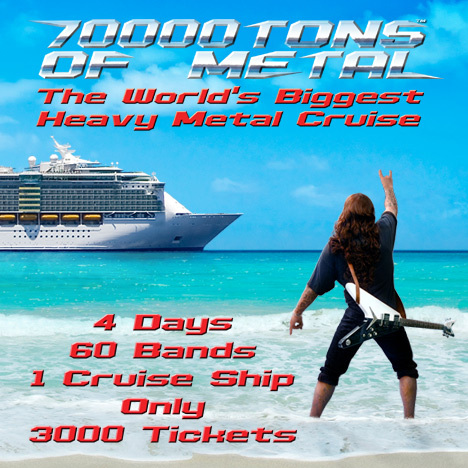 The world’s first extreme metal cruise, Barge to Hell, featuring 40 bands of extreme metal’s best bands is set to depart from Miami, Florida on December 3, 2012 for Nassau, Bahamas and back on December 7, 2012. Tickets are now on sale. The luxury cruise will feature two performances from each band on three different stages, karaoke, and more. Despite producing an endless amount of albums, going on worldwide tours with HYPOCRISY and various other bands, workaholic Peter Tägtgren still finds time for his pet project, PAIN. As another creative outlet for the HYPOCRISY mastermind, PAIN serves as a fun project with a more mainstream output. The first few seconds of Cynic Paradise starts off with a keyboard passage eerily similar to the beginning of the self-titled HYPOCRISY album, then continues in typical PAIN fashion with an industrial/metal feel. Aside from the ridiculous song title and lyrics, “Monkey Business” has an aggressive riff attack, and is very HYPOCRISY influenced, but still has enough to distinguish the difference between the two bands. The metal/electronic fusion yields varied results, and tracks like “Follow Me” and “No One Knows” are clunkers which are geared for the mainstream crowd. Cynic Paradise has a few fun party songs, like “Have A Drink on Me” and “Life Fast/Die Young,” and are light hearted songs with good hooks. “Don’t Care” could be mistaken as a track from HYPOCRISY’s doomed Catch-22 album, but Cynic Paradise ends on a strong note. “Feed Us” is a fitting closer with a nicely added piano piece, and also features NIGHTWISH frontwoman Anette Olzon. Olzon’s voice adds another dimension to balance the harsh downtuned guitars and Tägtgren’s vocals, and thus completes another chapter in the PAIN series. Sweden’s long running death metallers HYPOCRISY, have uploaded their latest video clip for the song “Weed Out The Weak” off of their new album, A Taste of Extreme Divinity. While DARK FUNERAL’s last album, Attero Totus Sanctus, was a good album, Angelus Exuro Pro Eternus is a milestone for the band. It’s highly possible that Angelus Exuro Pro Eternus is the band’s finest work thus far. And that’s not bad considering the fact that DARK FUNERAL has always delivered quality music. With new blastmaster Dominator (IN BATTLE) in tow, the band unleash their trademark darkness, blasting speeds, scorching melodies, and excellent vocals. The most noticeable distinction between Angelus Exuro Pro Eternus and its predecessors is the grander scale and attention paid to creating stronger atmospheres. The proof is in the song writing as tension and atmosphere is developed with a potent and natural flow. Sure, DARK FUNERAL continue to blast at lighting speeds when the time calls for it, but slower, more moodier songs such as “My Funeral” and “In My Dreams” demonstrate a growing musical palette for the band. Another distinction between this album and its predecessors are the subtle enhancements in songwriting that give a stronger sense of power and impact. For example, the title track has sections where the tempos are fast and there is an effective transition which then transitions into an even faster tempo shift. Vocalist Emperor Magus Caligula lays down another godly performance as he uses his range of different styles to give the song exactly what it needs to be put over the top. Speaking of Emperor Magus Caligula, he once again proves why he is one of the best vocalists in extreme metal. His absolutely hellish high screams are awesome, especially when he holds out the screams for a long note. His use of his lower death metal vocals, spoken vocals, and higher screams are all blended in naturally to form a strong cohesive identity as opposed to a cut-and-paste approach. The rest of the band, including leader/guitarist Lord Ahriman, should not be discounted as their performances on Angelus Exuro Pro Eternus are noteworthy as well.